The program first resets the position of the scan arm (holding the color sensor) and then the tilt arm. If the turntable starts to rotate or the two arms do not move in this order, please carefully check that cables have been connected to the correct ports on the EV3 as shown by the color coding in the build instructions. 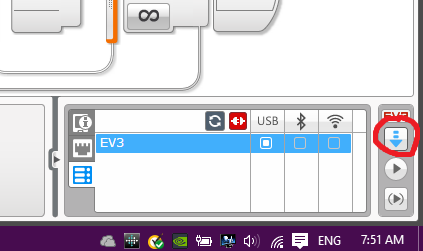 During this period, the EV3 buttons flashes red. The program then connects to the mc3solver-v2p1.rtf program that was downloaded to the EV3. If the program is found, the EV3 makes a short beep and continues. If the solver program is not running, the buttons continues to flash red and the message "Find solver" is displayed on the EV3 screen. 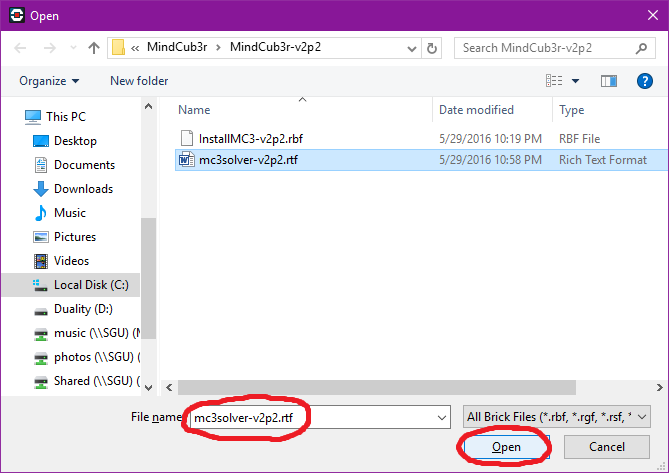 If this happens, please check that the "mc3solver-v2p1.rtf" program has been downloaded to the MindCub3r-v2p1 or MindCub3r-Ed-v2p1 project folder on the EV3 and that the "MC3 Solver v2p1" application has been installed and run once. 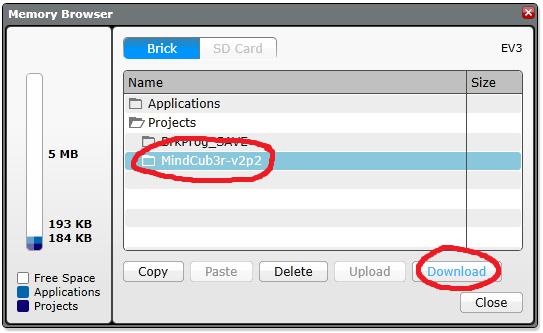 When MindCub3r is ready to start, the EV3 buttons turn orange and the message "Insert cube..." is displayed on the screen. Gently turn the turntable in each direction with your finger so that it moves slightly because of "play" in the gears connecting it to the motor. If necessary, adjust the position of the motor so that there is an equal mount of play in each direction. Use the left and right buttons on the EV3 to do this. A short press nudges the motor by a small angle. Holding the button for longer moves it by larger angles more quickly. Insert a scambled Rubik's Cube into the turntable tray and MindCub3r will start to scan and solve the cube. 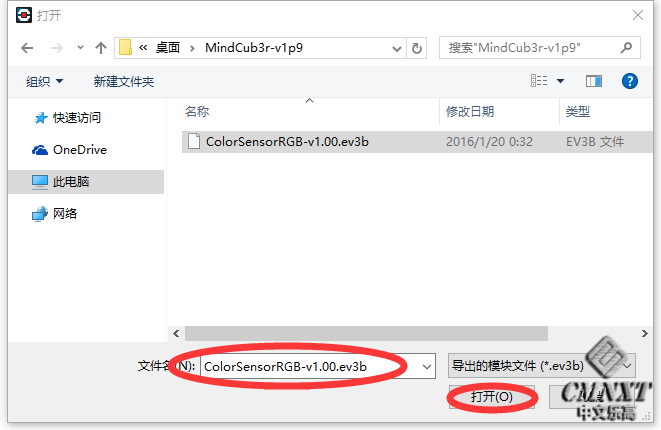 MindCub3r may scan the cube up to three times if it is unable to determine the colors at first. 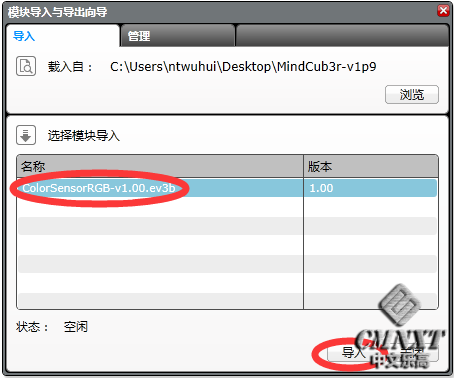 If the scanned colors do not result in a valid pattern, MindCub3r will stop after the third attempt and display the message "Scan error" on the EV3 display. If this happens, there may be a number of possible causes. 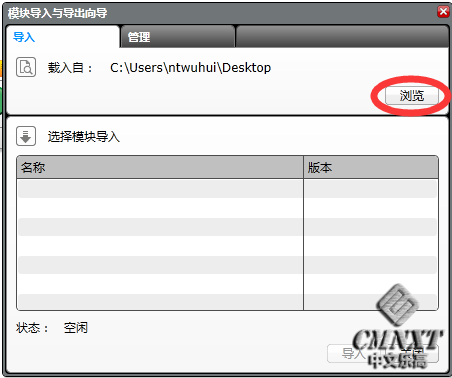 See the troubleshooting section. MindCub3r can solve the cube directly into patterns or scramble it. Before inserting the cube, use the up and down buttons on the EV3 to select a specific pattern, "All" to create each pattern in turn or "Random" to cause MindCub3r to solve normally and occasionally generate a random pattern. Selecting "Scramble" will make MindCub3r scramble the cube without scanning it. If there is a cube present before MindCub3r is ready, the buttons will stay red and the message "Remove cube..." is displayed for you to remove the cube. If this happens even when no cube is present or if MindCub3r does not start to scan the cube when it is inserted, please check that the cables to the infra red or ultrasonic and color sensors are connected to the correct ports on the EV3 as shown in by the color coding in the build instructions. Check that the tilt arm has been built exactly as shown in the build instructions. In particular, carefully check the position of the grey connectors and pegs that connect the tilt arm to the levers from the tilt motor. 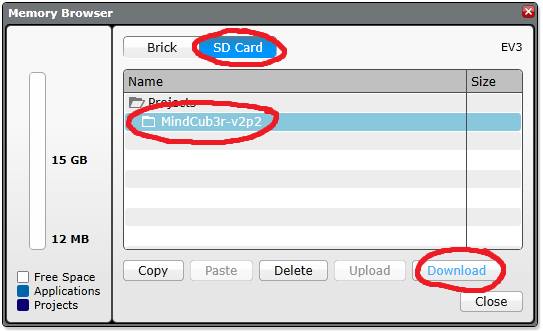 If MindCub3r attempts to scan the cube 3 times and displays the message "Scan error" the following tips may help. MindCub3r is designed to work with an official Rubik's Cube branded by Rubik's. However, it should work with most cubes provided one set of stickers is white and the others are distinct colors. It is optimized to work with white, yellow, red, orange, green and blue stickers. NOTE: cubes with very bright, vivid, "fluorescent" stickers may not scan reliably because the LEGO color sensor can return similar values for colors that look different to us. If none of the other tips help and you think this may be an issue, please consider replacing the stickers with more conventional colors or try an alternative cube. 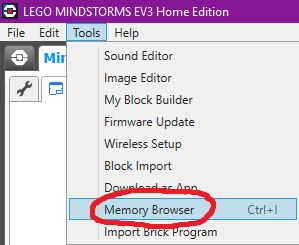 Make sure latest version of the EV3 firmware from LEGO is installed on the EV3. 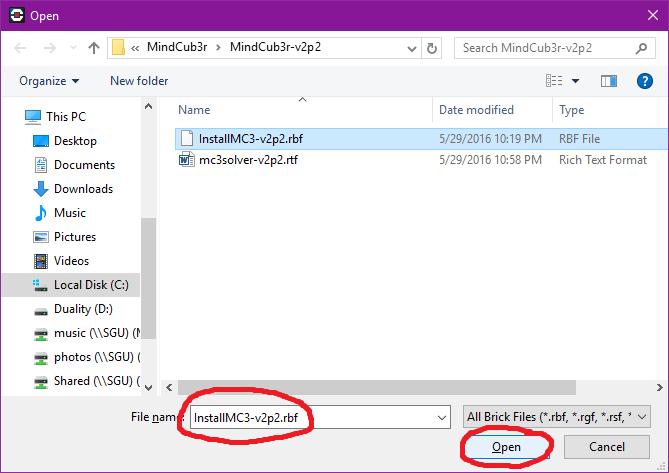 Make sure latest release of the MindCub3r software is installed. Even if the cube appears to tilt each time during the scan, it may be that the cube is being pushed too far across the turntable affecting its position under the color sensor. Check that the tilt arm has been built exactly as shown in the build instructions. In particular, carefully check the position of the grey connectors and pegs that connect the tilt arm to the levers from the tilt motor. If the EV3 is positioned one hole too far towards the turntable, the corner of the turntable may catch on the edge of the screen causing it to "jump" a little as the turntable rotates. 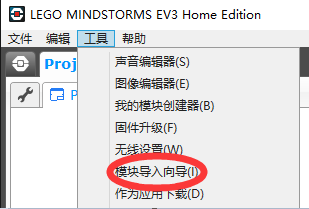 Check that the EV3 is positioned exactly as shown in the build instructions. If this does not help, please upload a video showing a failing scan with close up views of the scan arm from different angles and the position of the color sensor over the cube as the scan arm moves and post a link on the MindCuber Facebook page and I will try to help. GMT+8, 2019-4-23 16:37 , Processed in 0.033206 second(s), 26 queries .